(I listened to this book – great reading by Dion Graham! – so I may get some details and spellings wrong as I don’t have any notes to refer to). There are a lot of similarities with Angie Thomas’s magnificent The Hate U Give (2017), though this is a much more condensed and less richly textured book. However, it takes the viewpoint of a young black man which gives it a different, perhaps more immediate, perspective. Jus is a wonderfully complex and knotty character. He realizes that he can’t get away from his skin color and he finds himself torn between what he sees as the two options: either following his dreams but having to swallow his gall at being patronized and belittled in the white world or becoming like his old friends from the neighborhood enmeshed in gang life. Can he, like Martin, find a middle path? Other characters are somewhat underdeveloped but are thumbnails of different outlooks: Jus’s black friend Manny comes from an affluent family though they still feel the sting of racism; the group of white “bro’s” ostensibly believe they’re in a color blind world but their dog whistle comments show otherwise; Jus’s love interest, Jewish Sarah Jane, is just a little bit too perfect as a white ally. The narrative is split between Jus’s letters, script-like conversations and discussions, and a third person pov. It moves along speedily through Jus’s senior year and into the next chapter of his life, but I didn’t feel short-changed by the sprightly 41/2 hours. 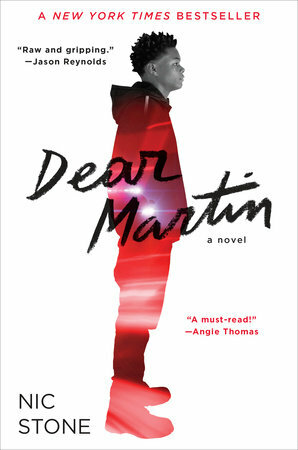 This is a well-written and thought-provoking book and should find its way into all teen collections. This middle grade historical fantasy adventure, the start of a trilogy, has many of Ms Nielsen’s signature charms but is derailed by an over-complicated plot. 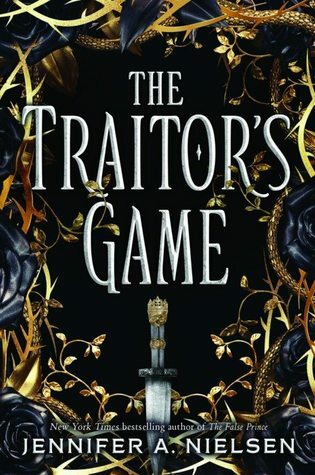 16 year-old aristocratic Kestra Dallisor is blackmailed into helping the rebel Coracks find the Olden Blade – the only weapon that can kill the evil, and immortal, ruler Lord Endrick. She is assisted by her former servant turned rebel Simon, with whom she has a love-hate relationship and Trina, who is decidedly not amused to take the role of Kestra’s handmaid. All three of these central characters have their secrets, and much like other JAN novels, these are gradually revealed. But none of the twists have quite the shock value that they should have because they’re bogged down in a thick stew of explanations. Dual narrators, Kestra and Simon, are angst-ridden teens fighting their attraction to each other and it isn’t really a spoiler to tell you that it’s a battle they don’t win. Kestra is a modern spec fic young woman – she is feisty and snarky, stubborn, emotional, apt to blame herself for everything, and a whizz with the weapons du jour. She becomes conflicted as her awareness of the real state of Antora outside of the sheltered confines of the capital grows. Simon is standard issue dishy with hair that flops adorably out of place, thoughtful, and righteous. In this sort of adventure, world building and plotting is crucial and I’m afraid this isn’t up to JAN’s usual standard: the world building, while reminiscent of The False Prince’s Carthya, is overly complicated (there just seems no point in inventing and having to describe new creatures) and characters spend a lot of time explaining things to each other. There are some rather clunky shifts as minds are rapidly changed and secrets are conveniently revealed, and some sloppiness leads to a couple of gaping plot holes. The end is pretty predictable as we get set up for the sequel. Overall this was a little disappointing for me, lacking the charm and freshness of the The False Prince (2012) and The Scourge (2016), though fans of this genre will doubtless romp through it. Magic is draining out of the world, leaving very little for the fairies to be use to grant wishes. When rookie wish granter Ophelia Delphinium Fidgets is finally sent on her first mission, to get a purple bike for a girl called Kesarah, it should be fairly straightforward. Instead Ophelia gets into one pickle after another before realizing that sometimes rules have to be broken. Anderson, better known for his sharp and nimbly written realistic novels Ms Bixby’s Last Day and Posted, has created a fanciful world: a quirky mixture of whimsical wishlore and portentous digressions about the loss of wonder juxtaposed with the officialdom of the fairy world and the quotidian lives of the fairies (Ophelia is a fan of the mocha lattes in the new café on the 147th floor of Grant Tower). However, this scene setting slows down the pace, particularly in the first third of the book. Ophelia is headstrong, impulsive, and initially rather a know it all, but as her adventures pile up she recognizes that she can’t do everything on her own or in her own way. 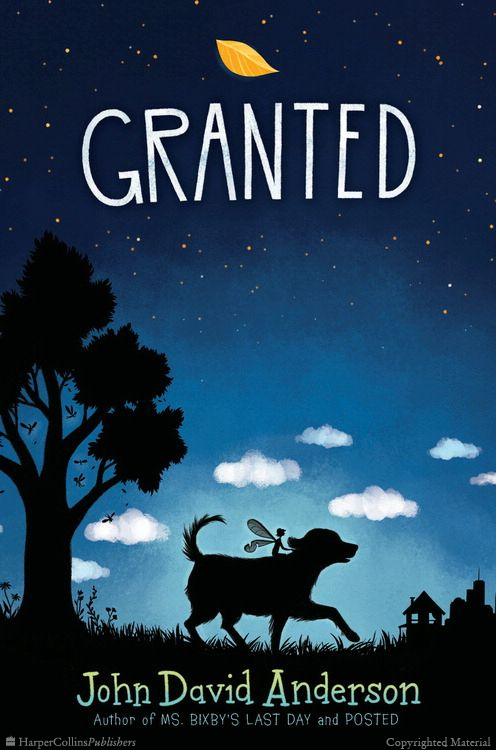 She teams up with a stray mutt with a heart of gold, who is used to being called “Stupid Dog” but she calls him Sam. The warm-hearted core of the novel rests with this affectionate partnership as they both learn the value of friendship and helping each other. While this didn’t have quite the same grip of Mr Anderson’s school novels or the same acute appeal to a specific age group, it is pleasantly imaginative and folksy. Ideal for readers of fairybooks who want to peek behind the curtain. A wacky novel celebrating the imagination, creativity, and kindness of children, set in an oddly anachronistic English hospital. When Tom gets hit on the head by a cricket ball at his boarding school, he is whisked to the children’s ward in London’s Lord Funt Hospital. There he discovers the Midnight Gang, fellow child patients who escape from their beds at night to make a dream come true for one of their numbers with the aid of the porter. 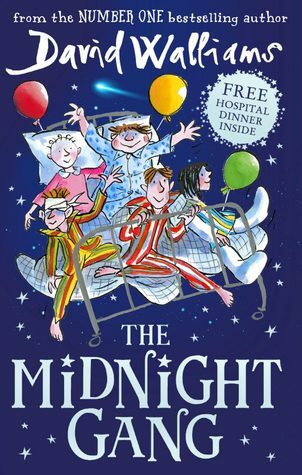 A lot of this is very sweet, gently funny, and anarchic in a Roald Dahl sort of way and Tony Ross’s whimsical and exuberant illustrations compound the comparison. However, the novel is old-fashioned though not in a good way, feeling reminiscent of a children’s story from the 1950’s complete with all the oblivious racism and classism of that time. The only person of color is the “dinner lady” Tootsie with her “huge Afro hairstyle” , who speaks “as if she were singing a song.” Dilly, one of the hospital cleaners, is a lazy caricatures of English working class incompetence, complete with cigarette permanently dangling from her mouth. Other adults including the matron and the headmaster of Tom’s school who are straight out of the Dahl-playbook of cruel child haters. The Midnight Gang themselves are swiftly delineated: Amber is bossy, Robin is a smart alec, George is fat. Only the very sick Sally, left out of the gang as she is too weak to join in, and Tom himself who is a lonely and bullied child, show any semblance of being characters. Mr Walliams is very popular in the UK as both a comedian and children’s author and he has had several books published in the US, including The Demon Dentist (2016). However, this book feels like a misfire to me and I wouldn’t recommend it to even the most Anglophile kid.